1984 was a notable year for two reasons: It was the year I graduated from high school and the year Congress failed to drain the swamp. That’s right — Trump wasn’t the first politician to have the idea, but I’m hoping that with a little bit of persistence, and some good guys on our side, the idea can finally be successfully executed. “Draining the swamp” was one of President Trump’s campaign promises and is now coming to fruition. The executive reorganization authority, also referred to as “presidential reorganization authority,” allows the president to reorganize government agencies and services as quickly and efficiently as possible. (Within reason; keep in mind that “quickly” and “efficiently” are not terms often associated with our gigantic government bureaucracy.) This law took effect in 1932, but eventually lapsed in 1984. Now, two senators are trying to bring it back: Ron Johnson from Wisconsin and James Lankford from Oklahoma. What I like about this law is that it allows the president to actually help Congress drain the swamp. Think about how hard that is to accomplish. It requires asking elected officials to reduce their power and prestige, which oftentimes can end up hurting their own political standing. Ultimately, they answer to their constituents for all their actions and decisions, but, with this law, they can make the president shoulder half of the blame. Nothing new there! 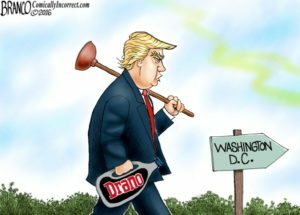 Draining the swamp can’t be achieved overnight, but we can keep pulling one plug at a time to make it happen. This article details how the plan would work and how Senators Johnson and Lankford are trying to get it passed. President Donald Trump’s administration released a plan June 21 that, if enacted, would impose some order on the sprawling administrative state—something that is long overdue. Decades of ceaseless expansion of the size and scope of the federal government have created a bloated and inefficient federal bureaucracy, replete with agencies and offices with overlapping functions. The Rube Goldberg-esque structure of the federal bureaucracy is not only expensive, it thickens the web of government red tape, makes government services less efficient, and makes mission failure more likely by splintering simple jobs among diffuse agencies. Trump’s plan would begin the long process of rearranging the overgrown federal bureaucracy by grafting together agencies that do similar work and pruning away offices that have outlived their usefulness. More on the specifics of the reorganization plan can be found here. However, while the president directs the executive branch, its structure is largely the product of Congress. Through the legislative process, it creates departments and agencies, establishes their responsibilities, and determines their funding. While Congress sometimes delegates authority to the president to determine how staff and funds are deployed or even how an agency is organized, major shakeups require congressional action. That’s where legislation introduced June 27 by Sens. Ron Johnson, R-Wis., and James Lankford, R-Okla., comes in. Their bill, the Reforming Government Act of 2018, would give the president the power to draw up a broad plan for reorganization—the specifics of which could go far beyond what his administration has already proposed—to be considered under expedited parliamentary procedures in Congress. If the legislation passes, the president could draft a plan to create, abolish, or move entire departments of the federal government (or sub-units thereof). Agencies that have overlapping functions—for example, the Department of Agriculture’s Food Safety and Inspection Service and the Food and Drug Administration, which also inspects food—could be merged. Government services spread across dozens of agencies could be consolidated into the most appropriate agency. Financial education programs, for example, are currently operating across 20 agencies, and job training programs are even more diffuse, spread across 40 agencies. There are literally hundreds of similar examples of overlap, fragmentation, and duplication that a reorganization plan could address. The only limitations the Johnson-Lankford bill imposes is that the president’s reorganization plan must be “efficiency-enhancing.” That means that any plan would reduce the number of government agencies and save money, while preventing the merging, abolishing, or moving of independent agencies, such as the Federal Trade Commission and Federal Election Commission. Once the president formulates a reorganization plan, the proposal would go to Congress for fast-track consideration. Like other bills, the plan would first go through committees in both the House and Senate. But unlike other bills, those committees would only have 75 days to read it and provide their recommendations to the Congress at large. Once the 75 days lapse, the reorganization plan would leave committees for the floor automatically—with or without the committees’ recommendations. After moving to the floor of Congress, debate would be limited to 10 hours, and then members would cast an up-or-down vote on final passage of the resolution. At no point along the way would amendments be allowed. Essentially, once a president formulates a reorganization plan, Congress has two choices: Take it or leave it. Johnson and Lankford are wise to want to empower the executive branch to develop a government reorganization plan, instead of asking Congress to take on such a heavy lift. Incidentally, they are not the first legislators to suggest such an approach—Sens. Joseph Lieberman, I-Conn., and Mark Warner, D-Va., introduced a similar bill in 2012. The president, along with his or her White House staff and political appointees in the departments are more deeply embedded in, intimately familiar with, and prepared to diagnose the ailments of the administrative state. Past Congresses recognized the president’s comparative advantage in proposing and carrying out executive reorganizations, and from 1932 to 1984, the U.S. government enacted 93 separate executive reorganization plans. But, in 1984, Congress let this executive reorganization authority lapse. Aside from expertise, there is another reason it might be better to leave reorganization largely in the hands of the president. Members of Congress—each of whom serves on a number of committees that oversee one or several departments—often have incentives to fight any reorganization plan that lessens their own influence. While all members of Congress might agree that something must be done to pare back the sprawling federal bureaucracy in principle, each individual member of Congress is likely to adopt a NIMBY—“not in my backyard”—attitude to any concrete proposal that lessens the size and strength of the agencies under his or her committee’s or subcommittee’s jurisdiction. To be sure, this Congress has already done much to help the president cut back red tape. Using the Congressional Review Act, which allows Congress to strike down new federal regulations, it kept 16 costly Obama-era rules from going into effect. Prior to the 115th Congress, the Congressional Review Act had been used only once. Reforming the structure of government is at least as pressing as checking its excesses. After all, the tangled, obscure, and almost impenetrable nature of the administrative state is what makes the swamp analogy such a popular description of Washington. Written by John W. York, Ph.D., a policy analyst in the B. Kenneth Simon Center for Principles and Politics at The Heritage Foundation.